It' In The Air - Kleive tries his best Christensen, Darling-like bowed bass by Kjellemyr, but above all else, Terje goes crazy with the ring modulator! Excellent!! 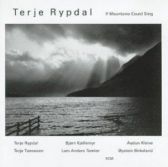 Blue Angel - lovely, just lovely - one of Terje's signature beautiful melodies, and one of my favorites - who can NOT love this one???? So I can't really find a significant weakness throughout this CD, other than some of the tracks are, like John said, not as developed as I'd have hoped, or taken to the next level of expression. But as they are, they are near-perfect little sparkling gems of what makes Rypdal so great, IMHO. That is why I consider IMCS one of the best "introductions to TR" that I can think of.